A big decision for anyone! Do you buy a telescope or a Universe2go? Which is better? Every instrument is full of possibilities. With which offers you better night-sky observations? Below, we have put together a table, which details the benefits of using a telescope versus a Universe2go. A telescope is a purely optical instrument. It collects light through its aperture, focusing and magnifying the light, which is how we can see far distanced objects in a much better. As early as 400 years ago and up to now, telescopes have functioned largely in the same way. With a telescope, you can view planets, star clusters, galactic nebulae and galaxies, millions of light years away. Despite it all being so far away, we see what is (or was) really there! Universe2go is a new development, however, which has only recently become possible with the invention of smartphones and offers us a new view of the heavens. In contrast to a telescope, Universe2go does not literally magnify what you see. We can see the stars, as you do with the naked eye. The Universe2go app then blends in a digital image of the night sky into your field of view. It then complements what we can see with the naked eye with constellation lines, names, as well as planets, star clusters, galactic nebulae and galaxies, all millions of lightyears away! What you see then, is not a magnification of what is really there, rather images of these celestial objects. It is a device, which allows you to learn about and study the night sky from our perspective. You can see real planets and nebulae, etc., albeit at a huge distance You can see the actually positioning of planets and nebulae, seeing images of celestial objects blended into your view. You can notice right away: telescopes and universe2go are two fundamentally different devices. 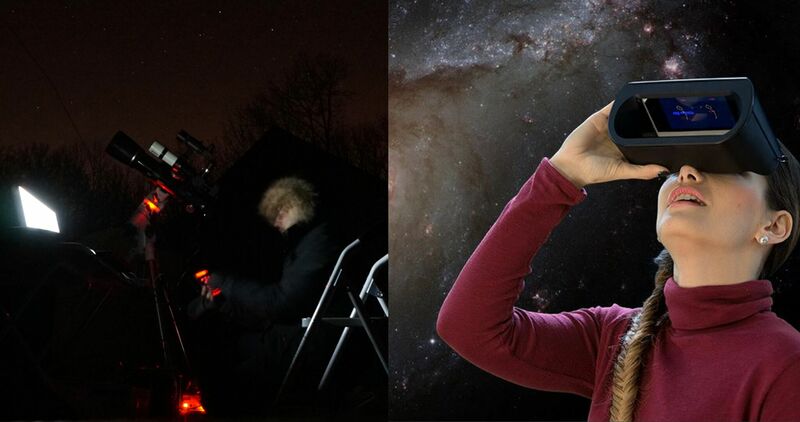 You can study and observe the night sky with both – just in different ways. The question remains: what suits you best? There is no exact answer to that question. Universe2go is a learning and multimedia device for the night sky. A telescope offers us a magnified view of the night sky. Only you, a telescope and the universe: an amazing experience! For those who like to spend a lot of time with the cosmos, should know the value of both devices, since they are fantastically complementary of one another. For those interested in the stars, desiring the knowledge, but lacking the time: Universe2go is the planetarium of choice.